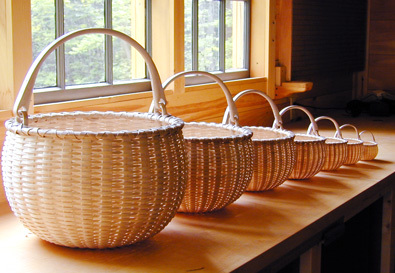 Stephen Zeh Basketmaker - Baskets handcrafted of brown ash by Stephen Zeh of Temple, Maine. Each Stephen Zeh basket is hand crafted of Maine brown ash using the tools and materials of the Maine woodsmen, Shakers, and Native American basket makers. A log of brown ash is pounded to separate the layers which are pulled off in long strips. Each splint is hand scraped. This gives it a smooth finish, yet brings out the texture and subtle color tones of the brown ash. These baskets are built in the same way the antique baskets were. They will develop a rich patina and become even more beautiful with age. 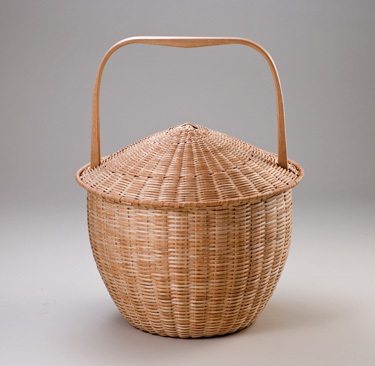 Stephen Zeh baskets are hand woven in miniature sizes in brown ash or in high karat gold or silver as a collectible to display in a hand crafted cabinet, or as a pendant to wear as jewelry. They make a memorable gift when paired with a handcrafted, personally inscribed presentation box.